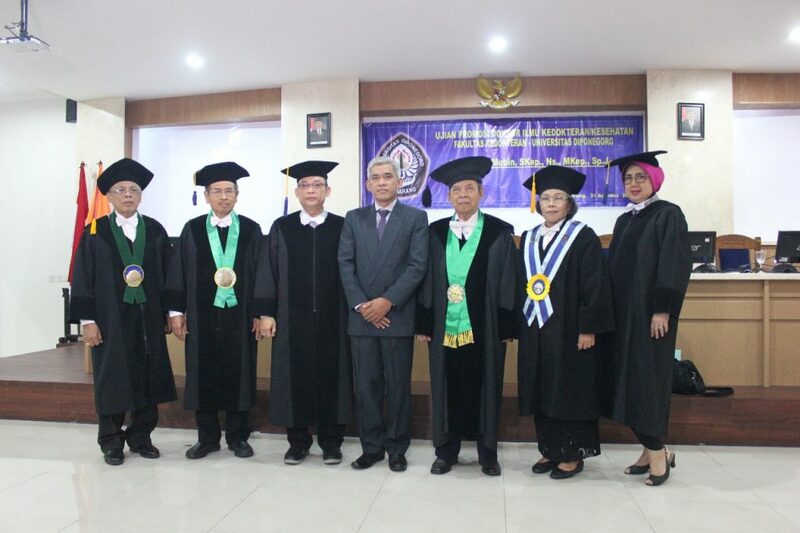 Semarang │Unimus (31/08/2018) Fatkhul Mubin, a lecturer of Nursing Department of FIKKES Unimus had successfully completed the study and gained the Doctor of Health Science in Doctorate Program of Medical/Health Science (DIKK) of Faculty of Medicine in Universities Diponegoro (Undip) Semarang. Promoted by Prof. Dr.dr. Ign. Riwanto, Sp.BD (K) and Co Promotor Prof. Dr. dr. H. Soewadi, Sp.KJ(K), MPH and Dr. Hastaning Sakti, M.Kes.,Psikolog, he defended and elaborated his dissertation entitled “Pengaruh Terapi Psikoedukasi Keluarga Skizofrenia Paranoid (TPEK-SP) Terhadap Kualitas Hidup Pasien”, in front of six examiners on Friday, 31 August 2018 with GPA 3,61. Fatkhul Mubin, father of two, who also in charge as the Head of Nursing Department of Unimus asserted that TPEK-SP therapy for Schizophrenia patient had been formulated by integrating three things that would trigger the recurrence such as characteristic, ODS paranoid and 5 roles of families’ health. Conducting study at Psychiatric Hospital of Dr. Amino Gondohutomo, Fatkhul tried to prove that implementing TPEK-SP therapy would give such influence to improve patients’ life quality that could be seen by any changes in giving treatment and ODS paranoid. ; the determinacy of taking medicine; stressful feeling and recurrence. “There are some problems encountered by family with schizophrenia patient (ODS Paranoid) such as knowledge, how to treat the patient, emotional expression, pressure and stressful mind. If this problem is still exist, it will surely influence the determinacy of taking medicine, recurrence, stressful, and life quality of the patient. Family as the primary caregiver should be given appropriate intervention to improve patients’ life quality. Psycho-education intervention of schizophrenia definitely assisted family to optimise better care for IDS paranoid at home,” Mubin elaborated. Innovation and invention based on Fatkhul Mubin study such as TPEK-SP therapy program gave meaningful contribution to medical/health science by considering and focusing on the specific characteristic of schizophrenia paranoid, family, and society as risk factor that play greater role in improving life quality and avoid recurrence of ODS paranoid. ” This program is proven to control risk of recurrence and improve life quality of ODS paranoid and the result of the study is expected to provide better health care especially nursing care in such Psychiatric Hospital,” Mubin ended. Prof. Dr.dr. Ign. Riwanto, Sp.BD (K) as the promotor of the examination congratulated Mubin because he has successfully accomplished his study. This achievement was impossible without patience, determination and totally hardwork. “I do appreciate for Mubin’s determination that lead him into this success so far. In addition, I suggest you to keep being productive. Don’t stop when you’re tired, stop when you’re done,” expressed Prof. Riwanto. Whereas, Rector of Unimus, Prof. Dr. Masrukhi stated that Dr. Fatkhul Mubin should motivate and inspire another lecturers of Unimus to take or complete their Doctoral Degree as soon as possible. 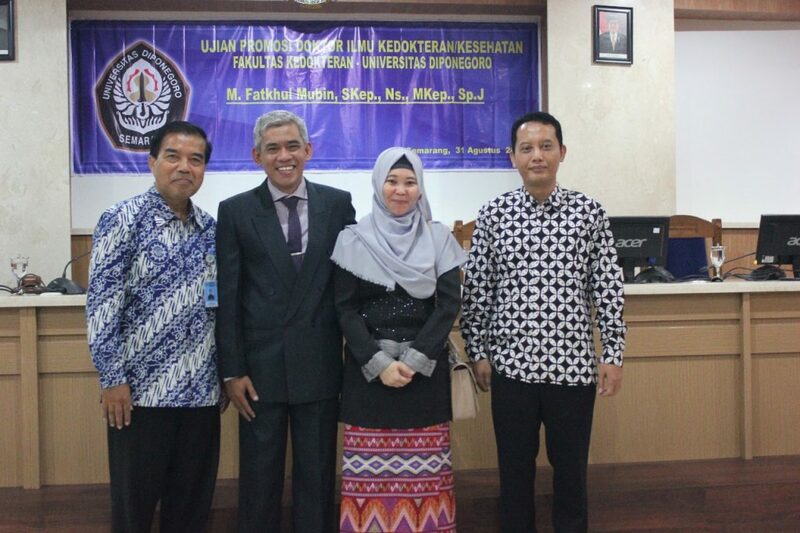 “By having new Doctor, hopefully Unimus will get stronger and better at providing services to students of Unimus. Rector also hoped that Dr. Mubin will give direct contribution to schizophrenia patient,” he ended.